I know that some readers find skeptics intensely irritating. Being asked to read for a skeptic makes those readers question why they should put their heart-based effort into something that the client will refuse to take seriously. 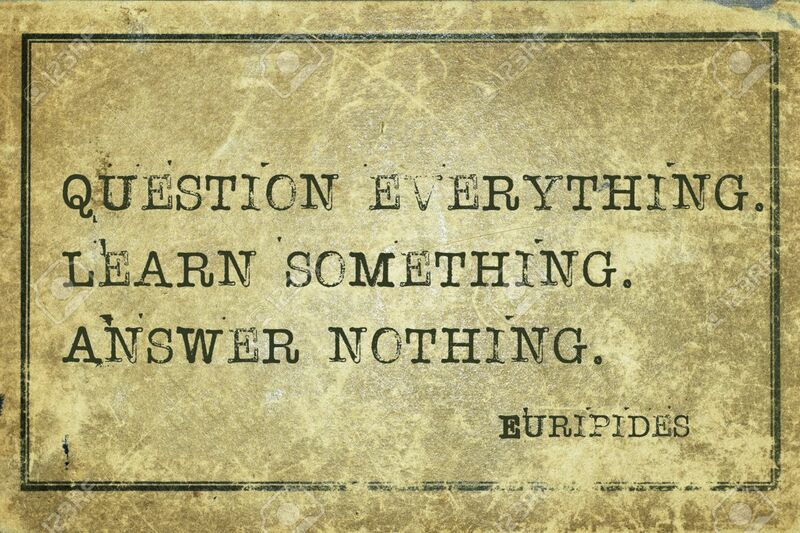 Skeptics have figured out something that we should all know and should all incorporate as one of our guiding principles: always question everything. Why wouldn’t you? Especially in these days of “fake news.” But even before that. I was raised not to blindly believe anything, not even the stuff my teachers taught me in school, not even the facts I read in my textbooks. My father, in particular, insisted that critical thinking skills always apply and that I should verify the truth of things to my own satisfaction before deciding that I believe it. And even then, I should always consider the possibility that I might be wrong. And yes, that applies to tarot too. I would never want anyone to just believe me. Question everything I or anyone else says to you! * Use your critical thinking skills. That’s why you have them! Yes, I will put my best effort into reading accurately for you–and I hold myself to a high standard of integrity. But guess what, I’m fallible. I make mistakes. Even in math class, you check your work, don’t you? Tarot work should be doublechecked too; it should be carefully considered and critically examined. Skeptics demand honesty. Again, why wouldn’t you? Always, always, ALWAYS demand honesty of those you interact with and especially of so-called purveyors of information. Integrity demands honesty. The insight we look for in divination is located in the liminal spaces, the margins, the places where our minds meet. So, the truth is not just located in my words, sitting there, static and unchanging. The truth is electric, not insular. It keeps moving. You have to chase it! And even when you catch it, you will always already** be wrong, because it will have moved on. I think that’s why a lot of tarot readers talk so fast–they’re trying to keep up! Why is it always moving? Well, as both physical and cultural scientists can tell you, the second you observe something, you’ve changed it. The moment we look at your situation, we’ve changed it. And that means that the words I say to you are immediately at least a little out of date. I am not offering this as an excuse for sometimes being wrong. I’m simply stating a fact. The truth is, you come in for a tarot reading because you want to make changes, so don’t be surprised when those changes start before you even leave my office. And BECAUSE the truth has changed a little by the time you leave, you should take my words with a grain of salt. Yes, faith is an ingredient in a tarot reading. Tarot DOES get more accurate if you believe it will. And that might seem to be an argument against having your cards read if you are a skeptic. But I don’t regard that as really applicable, at least not for my readings. My feeling is, we need several ingredients to do a reading. We need faith, but we also need questioning. You supply the questioning; I’ll supply the faith. All will be well. Tarot is beneficial even to people who have no faith. Many psychologists use tarot in their practices. You don’t have to believe that information is coming from outside you to benefit from what the cards say. One thing most readers will tell you is that you already know the truth that is in the cards. The truth is already in YOU. So I don’t care if you believe in God or gods or supernatural realities or magic or anything like that. As long as we can both agree that YOU EXIST, then I’m fine. You don’t need faith to welcome a fresh perspective or to welcome help in pulling out what’s already in you. Some skeptics may choose to think that I’m just offering my own perspective out of my own brain. And that’s at least partly true. Whatever I see in your cards is definitely getting filtered through my brain. (Well, most of the time. Sometimes I do blurt things out that I don’t think came from me.) So maybe you don’t believe in cards in the sense that you don’t believe that the cards can reflect the knowledge of the universe. Still, though, just as we can both agree that you exist, we can probably also both agree that I EXIST. And, for your information, I’m well-educated, well-read, creative, intelligent, have a strong background in science (as in, I do science writing and editing as a large part of my day job), and, I am absolutely willing to question everything with you. You’ll likely get an even fresher perspective from me by questioning more, not less. So as for questions and skepticism–bring it on! Your questions, your doubts, will only make your reading better. *If you’re thinking, “hey, the Buddha said that first!” You’re right. **If you’re thinking, “hey, ‘always already’ is from Derrida!” You’re right about that too. Did Einstein believe in tarot? I doubt it! But he was often asked about religion. Here is the answer he gave to Rabbi Herbert S. Goldstein: “I believe in Spinoza’s God, who reveals himself in the harmony of all that exists, not in a God who concerns himself with the fate and the doings of mankind.” Now, that’s a statement we could have long discussions about! I don’t regard tarot as concerned about fate (see my comment that even the act of observation changes your future). Could tarot readers find common ground with Einstein’s belief in the “harmony of all that exists”? I believe so, although I don’t presume to think that Einstein would join me in my animism. Previous The first best practice: Kindness as a form of spiritual technology.